Primavera Sound has revealed its line-up for 2018. The Barcelona festival has locked down the likes of Björk, Nils Frahm and Jon Hopkins across the four-day program. 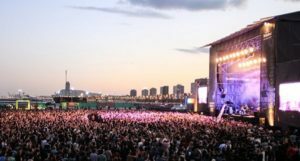 Running from 30th May to 2nd June, the event takes place on the Barça beachfront with headliners like Nick Cave and the Bad Seeds, Lorde and Arctic Monkeys’ return to the live circuit after a four-year hiatus. It’s one of the most comprehensive line-ups in the event’s history with over 200 acts performing at the multi-award winning festival. For dance music fans, this year’s edition delivers on all fronts with rising stars Peggy Gou, Shanti Celeste and Ross From Friends mingling with established names like Lindstrøm, Seth Troxler and Marcel Dettmann. Barça has long been known as a dance music hub with this year’s SONAR lineup looking equally impressive on 14th June and party collective Elrow based out of the Spanish city. Check the tweet below for the full line-up and ticket links.